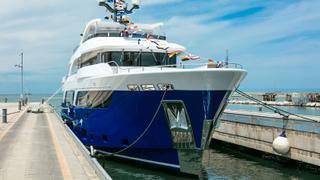 Gatto, a new 32 metre by Cantiere delle Marche (CdM), has been launched in Ancona, Italy, during a private celebration on May 17. The first steel Acciaio 105, a steel-hulled yacht with bulbous bow and a superstructure built in aluminium, has an enclosed tender garage – a first for CdM – and a beach club. 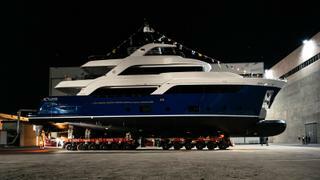 She will be unveiled to the public at the Cannes boat show. The new yacht was born in 2016 during a working dinner between shipyard and client representative. 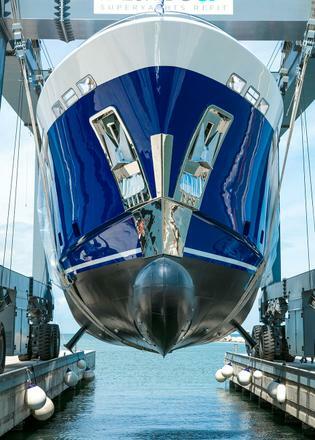 The owner was convinced of the shipyard’s capability, but his taste gravitated towards fast boats with more aggressive lines than the rugged Darwin explorer and the Nauta lines that CdM has built and delivered to date. 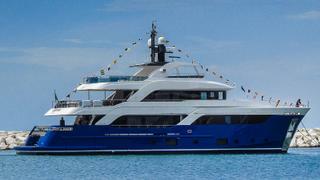 What helped convince the client was a sea trial on board the Darwin 107. 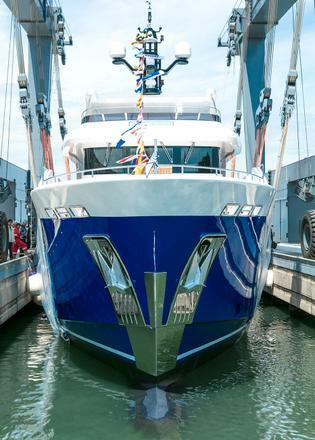 “We were lucky twice; we had a captain who is afraid of nothing, and 35 to 40 knot winds and three-metre waves,” Vasco Buonpensiere, the yard’s co-founder and sales director, said during the launch ceremony. Needless to say, the Darwin handled the conditions very well. The next step was an eventful dinner with the exterior design on speed dial. “We literally started from a drawing made on a restaurant’s table; I will never forget that dinner,” Buonpensiere said. The next morning, Hydro-Tec had a first design. “Gatto is the result of great teamwork,” Buonpensiere added, crediting owner representative Richard Kaye, Hydro Tec’s fast response and the entire CdM team for keeping the construction apace. One of the main challenges on the design side was to balance the boat’s high volume – she is 250GT – with a sleeker appearance. The hull also has a big flare forward but abundant space inside. Gatto’s “classic-contemporary” interior is by Francesco Guida Design. It’s the first time the Italian designer, known for his modern interiors on yachts built by Arcadia and the new ISA Extra 76, has worked with CdM. “We have created a unique look by designing linear furniture enriched with exquisite burnished metal details, while combining natural oak with white lacquered surfaces and glossy ebony details, we gave character to the ambiance,” Guida says. The interior is on the light side with abundant oak, larger windows and thinner mullions than found on the original CdM line of rugged explorers. The layout offers a master cabin on main deck, four guest cabins below with big portholes, and three double bed crew cabins. The mess is part of the well-equipped galley on main deck. The sun deck is a great open space all dedicated to entertainment since the tender is now housed in a garage. The passages are wide and stairs, including a dedicated stairway to the crew area, are comfortable, for easy circulation throughout. The spacious transom area is open with railings easily removed for an open view and the beach platform includes a Transformer passerelle. The tender garage, suitable for a five metre Williams jet tender, is equipped with a side hatch for launching, taking advantage of the space provided by the 7.5 metre beam. Powered with twin Caterpillar C18 of just 500hp each, Gatto will have transatlantic range at 10 knots and a top speed of 13 knots. Despite the addition of the garage, the engine room is like all boats by CdM, large and easily accessible. A larger Acciaio 118, sold in 2017 by Arcon Yachts, is also under construction at CdM and taking shape.